Ok, so I have to admit, after sharing this detailed floral coloring age I got a bit addicted to making adult coloring pages so I’ve made another one. But that’s a good thing, right? After hunting for a suitably inspirational quote linked to flowers I came across this one by Matisse which I think is rather lovely, I hope you like it too. And if you haven’t checked out all my other free pages there’s some links to my favourites at the bottom of this page for you. I can’t help but keep an eye on coloring books and pens, at the moment I’m using these pens which claim to work even after 8 weeks without a lid onthem (which will be handy with my kids around!) but I’d love to try out these pens soon too, the colors look gorgeous! There are two coloring books I quite fancy myself right now, this book of inspirational coloring pages would suit me perfectly and this colorful cities book looks fantastic! On Pinterest? Follow my free coloring pages board to see all my latest finds! 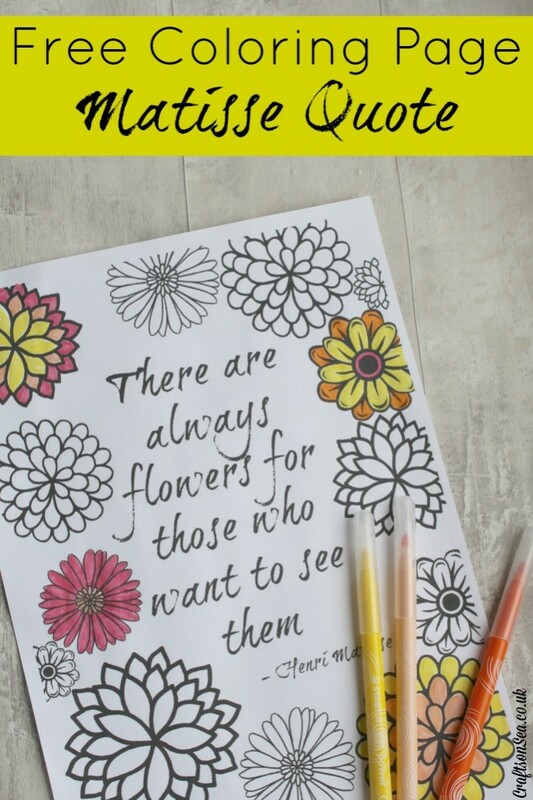 Follow Kate Williams CraftsonSea’s board Free Colouring Pages on Pinterest.